If you want to add a deck to your Perry Hall home but don’t want to deal with the constant upkeep, then AZEK composite decking will be your new best friend. Realtors stress that additions such as patios and composite decks will help a home sell faster. If you want to add a deck to your Perry Hall home but don’t want to deal with the constant upkeep, then AZEK composite decking will be your new best friend. This material is durable and offers much less hassle then decks made of wood. Initially, a composite deck will cost you more upfront than if you opted for a deck made from wood. Down the road, however, wooden decks require staining, are susceptible to bug infestations and don’t hold up as well as composite decks to the elements. The weather is generally mild in Perry Hall, but Maryland is known for having a few cases of extreme, wind, rain and snow every so often. A wooden deck can start to splinter and warp as side effects from excessive moisture, but AZEK retains its pleasing aesthetics no matter the weather. At most, you may just need to power wash your composite deck. Wooden decks cost a lot to maintain, but composite decks are almost maintenance free. The real estate market has changed over the years, and new homebuyers no longer want any “fixer uppers”. They want to move in immediately and not work on any projects. Wooden decks can get in pretty rough shape rather quickly and that’s a turnoff for a potential homebuyer. 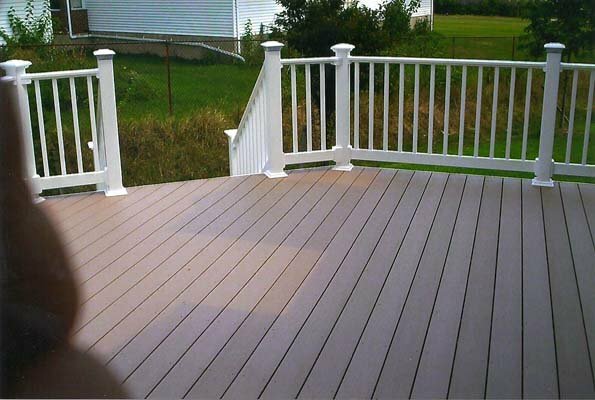 Since a composite deck is almost free of any maintenance, you can use that as a great selling point for your home. AZEK can offer the same pleasing aesthetics as wood, but the composite material will resist stains and scratches. Some people avoid entertaining because they don’t want spilled drinks or food to stain their decks, but you no longer have to live in fear with AZEK! If an accident were to happen, you can clean it up and won’t have to worry about stubborn stains being left behind. If you want to add a new deck to your Perry Hall home, then you are in the market for an AZEK composite deck. Freedom Fence and Home, which services the Perry Hall area, provides deck construction for homeowners who want to improve the look, and value, of their homes. Our crews are highly trained and have been performing deck construction for years. You can view our gallery to familiarize yourself with our work. This entry was posted on Wednesday, September 23rd, 2015	at 6:53 pm	. Both comments and pings are currently closed.